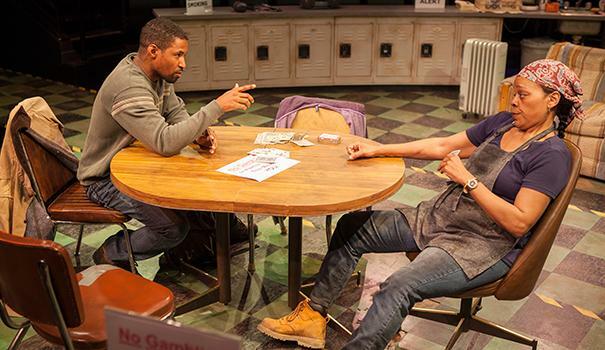 In association with Moxie Theatre, The Old Globe presents the West Coast premiere of Dominique Morisseau’s suspenseful coffee/locker room play, “Skeleton Crew,” through May 7 in the Sheryl and Harvey White Theatre. 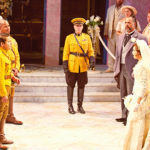 The work features a tight ensemble of four actors, possibly the best in regards to chemistry and balance that the Globe has assembled in many years. 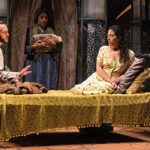 Heard by director Delicia Turner Sonnenberg (San Diego Critics Circle’s 2015 Director of the Year Award) in the Globe’s Powers New Voices Festival in 2014, the play piqued her interest and Sonnenberg apparently begged the powers that be to grant Moxie the rights to produce the play, which she intended to direct. The answer was yes, but at The Old Globe. This is Sonnenberg’s Old Globe directorial debut. 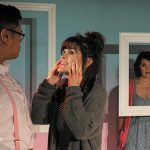 She co-founded Moxie in 2005 and serves as the esteemed company’s artistic director. The April 13 opening was well attended and the response was enthusiastic. 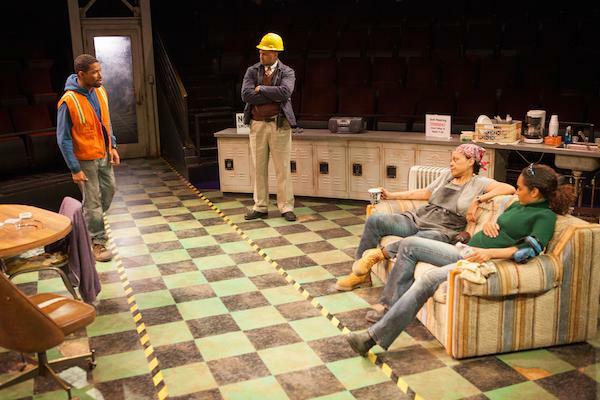 Part of a trilogy of plays about Detroit, the play concerns three longtime co-workers at an automotive-related factory where sheet metal is “stamped” into shapes such as doors and hoods for auto manufacture. The time is 2008, when industry closures were just beginning. 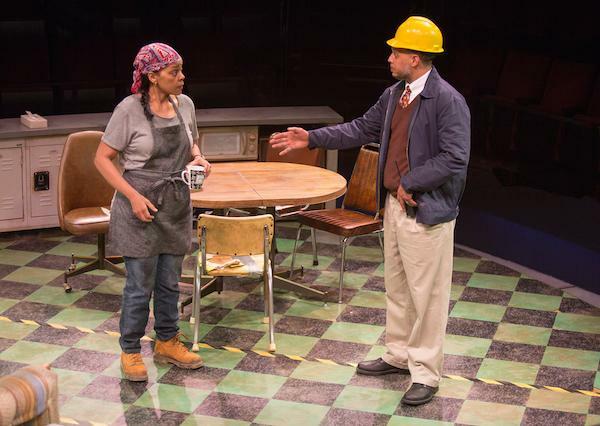 Reggie, the foreman (Brian Marable), knows the plant is closing by the end of the year and confides in Faye (Tonye Patano, a Craig Noel Award-winner in “Ruined” at La Jolla Playhouse), the worker with the most longevity, with whom he shares an almost familial relationship of many years. Faye was instrumental in getting Reggie the white-collar job, and he now has a house, a family and a college-bound daughter. Faye, one year from fully vested retirement, is sworn not to tell the others. 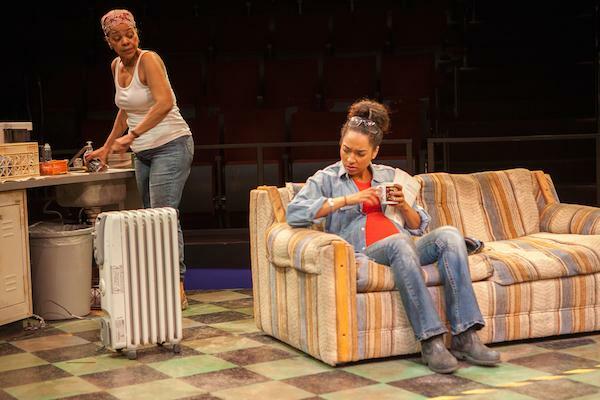 She is a very loving 60-something lesbian who acts as confidante to the two younger employees, Shanita (Rachel Nicks) and Dez (Amari Cheatom). Though a bit of a hustler, Dez is basically a good man and sincerely loves Shanita, who is pregnant with her first child (Dez is not the father). As time goes by, he garners a lot of suspicion over thefts that begin to occur at the plant as rumors of closing spread. The suspense relies on intricate dynamics between the characters as the story unfolds. The actors’ performances are well developed, each creating a character of individual integrity, with dimension and human interest. There are secrets to be revealed, and the last of them, stunning as it is, comes as no surprise to those who have listened carefully. It’s more an affirmation of what was suspected all along. These relationships run far more deeply than we first imagined. 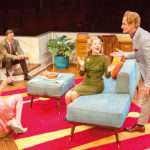 Tim Mackabee’s scenic design is redolent of rundown break rooms everywhere, flanked on two sides counters with lockers underneath, a microwave and mini fridge on one side, and a coffeepot on the other. 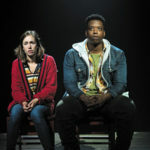 Sherrice Mojgani’s lighting design creates the feel of Midwestern winter, and Lindsay Jones’ sound design is a clever mix of factory sounds and percussive music.